Today's post over on Notes from the bunker, Biking Season Approaches, reminded me that I've been meaning to say something about bicycles here for awhile. This article makes some good points about the utility of bicycles in a post-SHTF scenario, and I covered them briefly in Bug Out: The Complete Plan for Escaping a Catastrophic Disaster Before It's Too Late . My current book project, Bug Out Vehicles and Shelters: Build and Outfit Your Life-Saving Escape , will have an entire chapter devoted to using bicycles as bug-out vehicles, including how to set them up for the purpose and how to get the engine (your body) fit for the task. Whether you ever need to actually use a bicycle to bug-out or not, riding one is a good idea for many reasons, $4.00 per gallon or higher gas being one, as that post points out. Another excellent reason is for the physical fitness, which you need no matter what your survival plans are. I read this just as I got in from a two and a half-hour ride today. I've been trying to put in at least three good rides per week to make up for all the time I'm having to spend at the keyboard working on these book projects. In my last post, I mentioned an overnight trip on my KLR 650 dual-sport motorcycle. Here is a photo taken just today of my other favorite two-wheeled transportation during a break in today's ride. This one is a Schwinn Voyager that I purchased new in 1994, along with a full set of front and rear Cannondale panniers. This was one of the last quality Schwinn touring bikes sold here when they were still making them with high-quality lugged Chro-Moly steel frames and decent components. The Voyager was specifically designed for loaded touring, with relaxed geometry, a triple chain ring for a wide range of gearing, and brazed-on eyelets for front and rear racks and three water bottle cages. 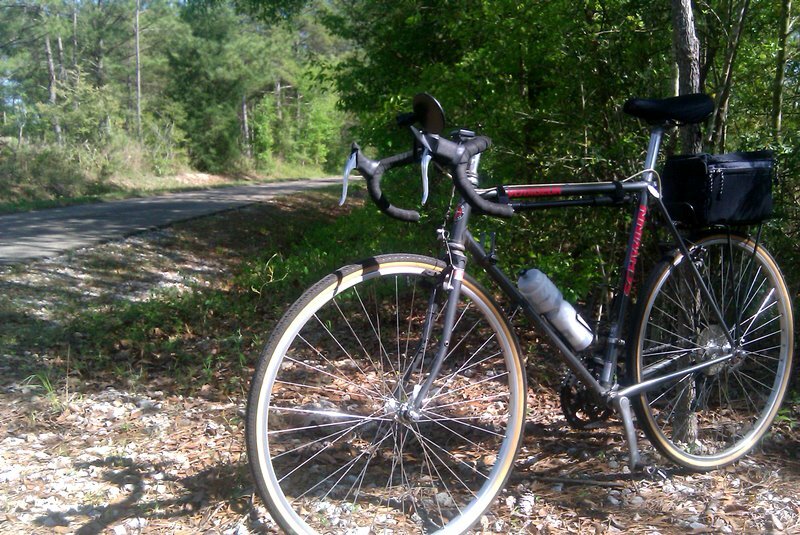 Despite its age, this bicycle has been utterly reliable for many thousands of miles and has the right blend of comfort and speed to make long, unloaded training rides enjoyable as well. Schwinn no longer makes a bike like this, but if I had to replace it today, viable touring options with similar build quality would be the Trek 520, Surly Long Haul Trucker, or perhaps the REI Novara Safari. A touring bike like this can really eat up the miles day after day, as long as you are in decent shape to ride it. While many other types of bicycles, including mountain bikes can be set up for touring or for bug-out vehicles, I prefer the road touring designs as they make it easier to maintain a decent average speed, especially in hilly or mountainous terrain. Most touring bikes can be fitted with wider, semi-knobby tires for use on gravel or other rough surfaces. The extra-strong, but flexible Chro-Moly frame absorbs shocks from bumps well, and holds up to carrying heavy loads. I'll post another photo of this one with the luggage attached next time I load it up. It will easily carry as much or more as you could carry in the largest backpack, yet do so at a speed that allows one to travel 40 to 100 or more miles per day, depending on terrain, fitness, weather, etc. Cool beans - bicycles are used the world over as alternate transportation even now. Around here, I see plenty of bicycles with a milk crate strapped to a rear rack - pretty sure they aren't there for decoration! Many cities are providing at least a few 'bike lanes' in their area too. I'm lucky in that we have a university campus very close to where we live - good nearby place to ride with plenty of paving. Just be careful. One of my coworker's husband was involved in a hit and run accident. The other rider riding along with him was killed outright, the husband hit off but luckily survived with only minor injuries - only one day in hospital. Wear high visibility clothing, some 'flashers' for extra attention and be careful. Most bike riders stay away from curb from the road debris, but this puts them closer to vehicle traffic where they can be struck. I've been riding/commuting for years. Here in the city I've learned to get a good map and study routes through neighborhoods, etc. that keep you away from heavy traffic. Just because you have a 'right to the road' doesn't make it safe. Get a rack - Blackburn is a good brand - carrying gear in a backpack makes you top-heavy, bad for balance and wears you out. Carry an extra tube and small pump, and whatever tools you may need for fixing that inevitable flat. (doesn't happen TOO often). The flasher lights, as noted) are great. Headlights are good, an improvised one with a maglite and rubber bands around the handlebars works well for a few hours. My rides are generally a mix of paved road, dirt road, bike path and trails. I can go places no car or motorcycle can go. Very useful in different situations. Also, a guy on a bike is viewed as mostly harmless, just somebody passing through, especially if they look neat - while a 'walker' is almost always viewed with suspicion - a bum or a thief is what people are thinking. I could take a bike in good repair and travel 1000 miles on just the food and gear I could carry. Believe it or not. I was just wondering...doesn't using a bike as a bug-out vehicle force you to stay on roads for the most part?..and as such...present you with a much higher chance of running into people...many of which will be hostile and want to take what you have. Just a thought. I'm gonna buy a bike in next few weeks and your site was very helpful. The site with Bicycle Recommendation Short List seems a bit outdated as the last update was done in May 2006 but the recomendations seem solid and I've realized that there are quite a few things I've had no clue about. Also, in response to post above, there's always people who will want to take what you have. To me, the ability to carry more gear, the speed and ability to get past traffic jams on 'evacuation routes' (I remember the highways around here at hurricane approach) also the ability to get off road and into the woods if the need arises trump walking big time. You can always ditch your bike and walk if you must. Also you can conceal a bike and come back to it....not easy with a car. A note on improvised racks...I saw a hobo on a bike and he had strapped a 2 x 4 along the top tube which extended out the front and back of the bike....with bags of gear hanging over the sides. Not exactly hi-tech, but something to remember. I converted a Mountain Bike for my tourer. To get the fit I was after I did go with one size smaller. I like the 26" wheels for strength and durability. There are a wide range of tires available - slicks, combo to very knobby offroad specific. The frame is stiffer under a heavy load too. The only disadvantage I've noticed is heal clearance requires slightly smaller panniers. The mobility of a bicycle in an emergency situation was brought home for me when while out riding in a rural area (one way in, one way out) an accident shut the road down. The steepness of the terrain made it impossible for cars, even 4x4 trucks to get by the obstruction. All that was required for the bicycles to pass was a short portage through the woods. Under normal conditions I've been stuck in traffic for hours due to weather, accidents, fires, avalanche control and road closures. I'm certain that in a mass evacuation scenario those blockages would only be amplified.